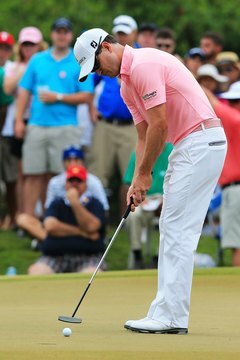 Zach Johnson uses a center-shafted putter at the 2012 Players Championship. A golfer walking into a shop in search of a new putter faces many choices regarding shaft length, club head shape, offset, loft and other considerations. With respect to the point at which the shaft attaches to the head, however, there are two main options: center-shafted putters and heel-shafted putters. While center-shafted putters have long been legal in the United States, they were banned in Great Britain in 1909. In 1951, the sport’s two main governing bodies -- the United States Golf Association and Britain’s Royal & Ancient Club -- agreed to standardize the Rules of Golf and made center-shafted putters legal worldwide. All other golf clubs must have shafts that attach to the club head at or near the heel. Club fitters typically recommend a player choose a putter that suits his putting style. Most center-shafted putters are face-balanced, with equal amounts of weight in the club head’s heel and toe. This type of club suits a player who keeps his eyes directly above the ball, takes the club straight back and swings straight through the ball. Players who employ this style try to keep the club head square from the beginning of the stroke to the end. It’s easier to keep a center-shafted, face-balanced club head from drifting right or left when hitting straight through the ball. To make certain a putter is face balanced, balance it on your finger, roughly 6 inches from the club head. If the club face remains horizontal, it’s face-balanced. Players who putt using the arc method may be better off with a toe-weighted putter. This style requires the golfer to pull the club a bit inside the target line on the backswing. The player returns to a square position at impact, then follows through by again moving the club inside the target line to complete the arc. To determine whether a putter is toe-weighted, repeat the balancing experiment from the previous section. If the putter is toe-weighted, the toe will dip down to the ground at about a 45-degree angle. Heel-shafted putters are more common on the PGA Tour, but plenty of pros use the center-shafted variety, particularly those who swing long putters or belly putters. Many tour pros find a center-shafted putter helps them align the ball properly, according to “Golf Digest.” Additionally, some pros feel that a face-balanced putter is easier to square up at impact.